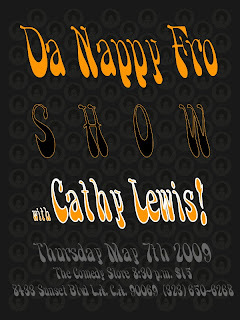 I'll be in: Da Nappy Fro Show hosted by the hilarious Cathy Lewis. in the "Main Room" this Thursday May 7th, 2009, Around 8:00 p.m. Tickets are $15. The World Famous Comedy Store on the Sunset Strip in West Hollywood. Apparently doesn't like democratic media. Curiously, the type of blogging comments she objects to sounds remarkably similar to many of the jokes in Jay's monologues. Oh, the irony! Because everybody knows that for art/expression to be valuable it has to first be validated by a vertically integrated multinational media corporation. Everybody knows that. Everybody knows that the purpose of art/expression is to sell 30s advertising spots. I'm with Tracey on that 100%. I think it's hilarious when people in television express "worry" about the internet. Like the revolution hasn't already happened. But don't worry, we still have radio stations so I'm sure TV stations will be around for awhile as well. NBC has a lot of funny shows. But I think the funniest thing that NBC ever did with their lineup was to remove it from iTunes just as the iPhone was becoming the dominant smartphone. Yeah, that was the master strategy!